Not long ago, Eric Swayne wrote a piece entitled Back to School 2014: A Social AND Shopping Occasion. His post looked at the whole “back to school” process and mindset from a retail perspective. He took us along as he, like so many of us, made the trek to their favorite retailers to load up their children with all the necessary and obligatory supplies and apparel. 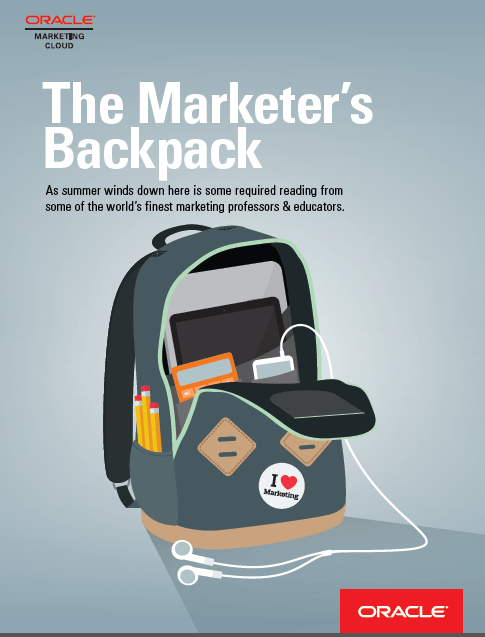 Today, however, I want to talk about “back to school” from the perspective of marketers themselves. See, school kids are not the only ones coming off summer vacation. Sure, marketers don’t get to take the entire summer off, at least none that I know of. But they do get to take a week or two (presumably) off to decompress, unwind, unplug, etc. And like school kids who more than likely forgot most of what they learned the previous year, marketers themselves perhaps forgot or lost sight of some lessons they learned – not just the previous year but over a much longer time frame. That was one of the questions posed to a very unique and heretofore unassembled group of marketing educators featured in a new eBook entitled The Marketer’s Backpack. And I am here to say: It’s okay you’re not alone. Among the other questions posed to the panel were what their thoughts on the differences between B2B and B2C marketing. Yes, I realize that topic has no shortage of opinions written about it, but to see what leading college professors have to say on the topic is quite different. Another topic queried, which should be of particular interest to those marketers who will be looking to hire new, right-out-of-school staff in the next few years is what these educators are teaching your future employees and co-workers. The eBook offers a fascinating glimpse into the minds the educators who live and breathe marketing just as you do, only they do it in a classroom. Download it here. Kudos to Steve Olenski (@steveolenski) and all the other Oracle Marketing Cloud folks that made this eBook happen. Chris Moody is Head of Global Content Marketing at Cheetah Digital. Chris is focused on effectively integrating content and social to drive qualified leads. The mission is to help build marketing solutions, and an entire company, that is *truly* dedicated to marketers and their success. This means there is an emphasis on business outcomes, not bloated processes and procedures that inhibit marketing's success. Chris has a lovely wife, son, daughter and pug in Raleigh, NC.